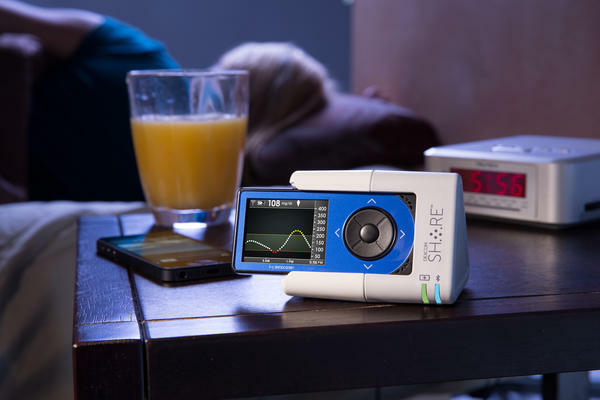 The Dexcom Share device is designed to help monitor glucose levels remotely. That technology is the latest step in an evolution aimed at letting people manage diabetes without the burden of calibrating insulin doses themselves. So far we have devices that deliver insulin and devices that continuously monitor blood sugar. Getting those two pieces of equipment to talk to each other would make the process safer and simpler. That's the technology that people really want. And that's starting to happen. Because that technology is rolling out bit by bit rather than all at once, it makes more sense to call it an artificial pancreas "system," according to Aaron Kowalski, chief mission officer and vice president for research at the Juvenile Diabetes Research Foundation (JDRF), a top funder of research into the systems. The devices are "trying to replace mechanically what's lost in diabetes," Kowalski tells Shots. The healthy human pancreas is an awesome machine, secreting the exact right amount of insulin into the bloodstream to allow the glucose from your food to enter your cells and be used for energy. When you eat, your pancreas secretes more insulin. When you exercise, it dials back the insulin. And if you don't eat for a long time, it makes another hormone called glucagon that tells your liver to put more sugar into your bloodstream. If you don't have diabetes, that system keeps your blood sugar within a very tight range. In people with Type 1 diabetes and some with longstanding Type 2 diabetes, that system is broken and the insulin has to be replaced manually, by shots or a pump. Insulin pumps, which have been available for decades, deliver insulin via a small catheter inserted under the skin throughout the day, but the wearer has to tell it how much and when. Getting it right all the time can be extremely difficult, because pump wearers have to check their blood sugar, make educated guesses about the amount of carbohydrates they're eating and how much they exercise, and set the pump accordingly. Essentially, it's trial and error. And even if you get an on-target blood sugar value once, the next day might turn out differently because you exercise or eat more or less or get sick or stressed or, as one patient quipped, "the moon was full." Enter continuous glucose monitors. Available for home use for the past decade, these devices are a huge advance. They automatically measure the wearer's glucose level every few minutes and wirelessly display the value, so wearers can see their sugar level trends at all times. The CGMs can also send out alarms when sugar levels go too high or too low. Many people now wear both a CGM and a pump, but that's not a true artificial pancreas system because the user still has to be the brain. New devices are starting to take on more of that responsibility. A system that shuts off the pump if the wearer's glucose level hits a preset low threshold was approved by the FDA in 2013. The Minimed 530G with Enlite from Medtronics Diabetes helps people avoid low sugars that can cause brain damage or death, and has allowed many parents of a child with diabetes to finally be able to sleep through the night without waking every few hours to check their child's levels. Even better would be a device that predicts when a person's blood sugar will get too low, and intervenes. That's exactly what 4-year-old Xavier Hames of Perth, Australia, got earlier this month. The device shuts off the pump when the CGM predicts that the blood sugar is about to drop too low, reducing the total number of dreaded low blood sugar episodes by almost 80 percent. That device, Medtronic's Minimed 640G with Smartguard, was hyped in news accounts as an "artificial pancreas," but it's not a fully automated system that will keep the boy's blood sugar normal all the time without any input from his parents. Yet Kowalski says the device's ability to prevent low blood sugars is "pretty huge." So far, the 640G is only available in Australia, but it's being tested in the United States, with the aim of future FDA approval. Still, neither of these systems addresses high blood sugars, which over time can damage the eyes, kidneys, heart and nerves in people with diabetes. In 2017, Medtronic plans to add a feature to dose insulin if glucose levels rise above a certain threshold. Further improvements on the technology are in clinical trials. These include: "hybrid" systems that are automated except that the wearer has to signal that he or she is about to eat; "closed-loop" systems that don't require such input; and a fully automated system that adds glucagon in addition to insulin. This last one, which the investigators call a "bionic pancreas," is a bit controversial in the field; some doctors think a functional artificial pancreas system can be achieved without adding the extra hormone, which is less stable than insulin. In the meantime, some tech-savvy members of the Type 1 diabetes community aren't waiting for trials or FDA approvals, having figured out how to "hack" their devices to create their own artificial pancreas systems. All of this is happening rapidly, but challenges still need to be overcome: For one, the insulin needs to be redesigned to work faster in order to prevent post-meal sugar spikes — after all, it's still being deposited under the skin, rather than directly into the bloodstream the way a healthy pancreas does it. Also, CGM accuracy needs to improve. Because the devices measure sugar in the tissues rather than the blood, it's not an exact match. Progress is being made on both fronts. And there's progress on the payment side, too. A Medtronic rep tells Shots that both the MiniMed 640G and the MiniMed 530G are priced similarly to previous systems. Insurance coverage varies greatly by country, of course, and also within the U.S. by insurance plan. The company contracts with more than 600 insurance plans nationwide. Ultimately, though, even if artificial pancreas technology evolves to the point of full automation, it's still a machine. It can break. And it's not a cure. Last October, researchers at Harvard announced that they had found a way to coax human embryonic stem cells into making insulin. The researchers are now working on encapsulating those cells so that they won't be attacked by the patient's immune system, the process that causes Type 1 diabetes in the first place. Other research is also focused on finding biological "cures." Kowalski sees artificial pancreas systems as a bridge until a biological cure becomes available. "Ultimately, we want to get rid of the devices. But in the meantime, we want to keep people healthy and ease the burden. So that's what we're trying to do: make smarter pumps until we have more nature-made solutions."